Jon was looking bright and breezy, in that sickening way that I was beginning to associate with American students on a dawn call. After coffee and bagels for me and pink health sludge for Jon, we left the house to find the streetlights still twinkling outside. I followed Jon in his car as far as the Interstate where I headed north for a few miles. As Jon had predicted, I was in Concord within twenty minutes. It was a pretty little town in its own right, and everything that Salem hadn’t been. I found a map next to a Visitor’s Bureau that was still closed. Although the Minutemen Monument itself wasn’t designated, there was a house up the road that had taken an early bullet in the battle. When I went to look for the house, I found everything that I wanted. There was the Monument, there was the bridge on either side of which the opposing forces had gathered, and there was the spot where the first British soldier had fallen. It was awesome in the true sense of the word, and all the better for my being one of only half a dozen other people there at the same time. I followed the Independence Trail through the 7 miles to Lexington and easily found the Green where the first gunshots of the Revolutionary War had been fired. A monument from the 19th Century told the tale. It was surrounded by a wrought iron fence, and the ground around it was littered with pennies. Around me the people of Lexington were quietly going about their business. I could almost believe that I’d come to the wrong place. One of the most important historical sites in the whole country, and not a flicker of razzmatazz about it. It looked like any village green. The road from Lexington to Boston took me through Cambridge, home to Harvard University. It felt scholarly and sylvan but was also beset by traffic; I had fifteen minutes of being nigh-on stationary to take in the views. From Cambridge, it was a short hop across the Charles River into Boston itself. Not because of priority, but because it was near to where I crossed the river, I went to have a look at the Cheers bar. It did look identical to the thing seen on the credits of the TV programme, but was actually named the Bullfinch Pub. A doorman on the steps of the Hampshire House Hotel above it invited me in to look around the souvenir shop. There were endless items emblazoned with the Cheers TM logo, but nothing showing any distinctive imagination. I bought a lighter. I was near the center of town, and it was short drive to see the Interstate 93 highway construction project. Or, at least it would have been, if there had been anything to see. Perhaps I was looking from the wrong vantage point, but it appeared to be like any other major piece of road construction with diversions, cones and heavy plant but nothing worth a photograph. I drove towards the waterfront so that I could at least pretend that I’d seen where the Boston Tea Party had taken place. I took a turning that wasn’t guarded by any no entry sign, and found myself driving across a pedestrian precinct in front of some hotels that looked out to sea. I jumped out to take a quick photograph before turning back and rejoining the main highway. Although I had been advised that it wasn’t worth a special trip, it was no huge diversion to head down to see Plymouth Rock. Plymouth was less than an hour south and it was still only eleven. 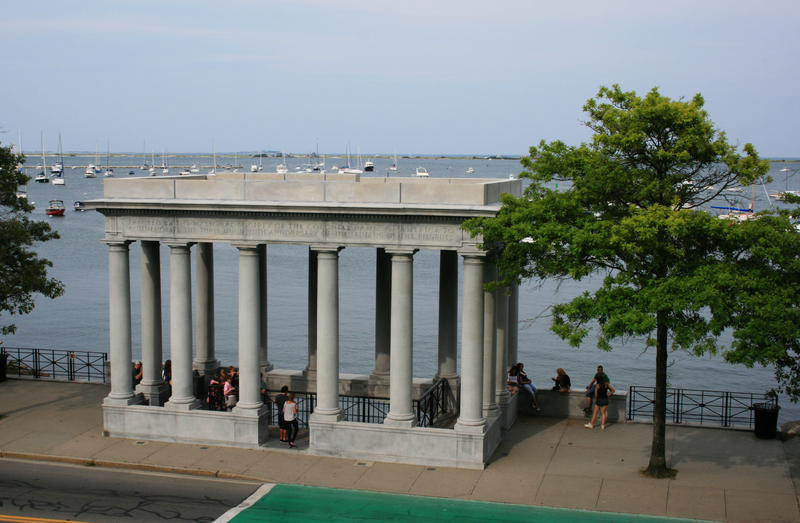 The rock itself – if indeed it was the rock, or if indeed Plymouth was the place where the Pilgrim Fathers had in fact landed – was protected by a kind of portico with Doric columns. 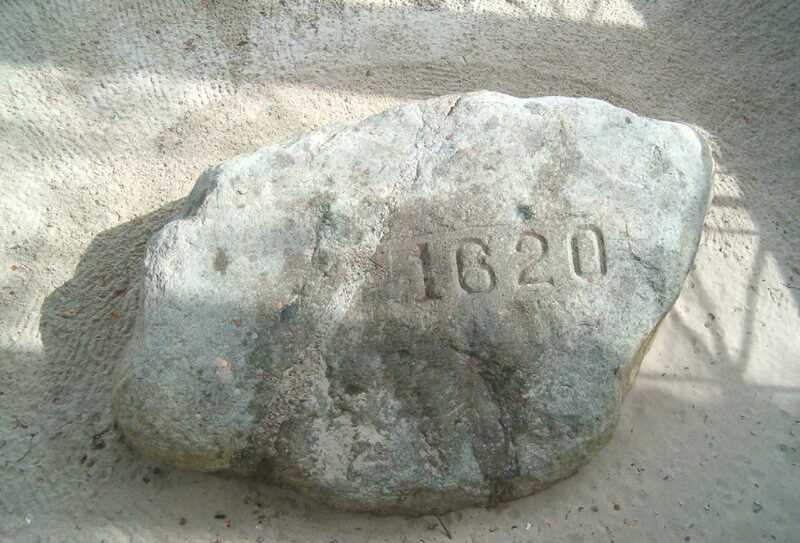 Somebody had carved “1620” into the rock, which seemed unnecessarily crass. I wanted to loop north and enter Rhode Island at Woonsocket. It was a place I wanted to visit for no better reason than it sounded like an anatomical reference to something discovered in the supposed autopsy at Roswell in 1947. It was 1.30pm as I found myself on the Interstate heading northwest, and tuned into a country station that was playing the ubiquitous Where I come from by Alan Jackson. This track must have been the only one that I had heard in all 46 states that I had visited so far. As the music faded out, the twangy voice of the DJ came over the airwaves in as sombre a tone as he was capable of mustering. “Well folks, in case you haven’t heard yet, it’s started.” The first American strikes in Afghanistan were underway. I tuned out of country and into news. I was about an hour behind the start of events. 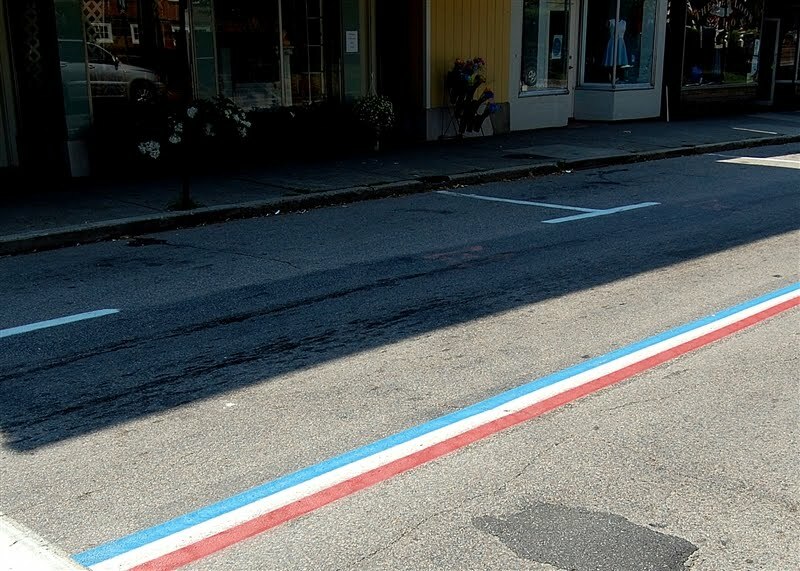 In the end, I was so absorbed by news of these events that I barely noticed Woonsocket. It certainly had nothing so intriguing about it that could have grabbed my attention away from what I was listening to on the radio. Just past Bristol, I noticed that the lines in the middle of the road were no longer comprised of two yellow stripes. Instead there was one continuous red and one continuous blue one, and in the middle where the tarmac of the highway usually showed through, a third white one had been painted. Go USA. It was still only 3.30 and I was already crossing back to the mainland at Plum Point. I had booked into a place called the Haddie Pierce near Wickford, and I was there less than seven minutes later. I hadn’t fared well at adjusting to these smaller states back east. The woman running the place was an aunt-like soul who offered a warm welcome. It was one of those B&Bs that was more like a private home. It was especially good if you liked dolls. About fifty of the things lived in my room alone. The woman’s name was Becky and she listened intently as I explained that this would be my last night on the road after a tour of all the 48 contiguous states and I wanted to go out with a bang. She assured me that I’d come to the right place for fun and that there was plenty of choice for evening entertainment in town. She thought my best bet would be the Seaport Tavern, which stayed open late for food and drinking. It was still early so I took the car the mile into town to have a quick look round. The place was dead. The dozen or so shops were all closed or just about to. I found the tavern and thought it best to check it out, before going to the lengths of driving back and walking in. A Portuguese woman greeted me at the door and warned me that they didn’t sell liquor, but were serving food for the next hour. They closed at seven. Containing my excitement, I sloped in. It looked like my only option for the night, and it transpired that they did at least have beer available. As she poured out the bottle, the woman explained that no liquor was allowed anywhere in Wickford but that I could venture to the Irish Pub just beyond the city limits later if I wanted. On the next table were an elderly couple down from Canada, who had emigrated from the UK thirty years previously and were keen to talk about the old country. I was feeling nostalgic about it myself having been gone all of seven weeks. They could never go back because they had become too used to the pace and the space of Canada. It kind of showed in their line of conversation. The thing that seemed most to preoccupy them was finding out what good detective dramas were currently being screened back home. They tended to get our programs a few years down the line. When I mentioned the trip and the book, they insisted that I write my name down for them. I then had to spend the next five minutes convincing them that I wasn’t the bloke who had written A Year in Provence. I still don’t think they believed me, as they winked that it was understandable for me to prefer travelling incognito. I left it as long as I could before ordering food. I still wasn’t hungry, but I thought I should have something. I can’t remember what it was I ordered, but I remember it tasting like muck when it arrived. It was like a frozen ready-meal that someone had shoved in the microwave. By the time I had finished forcing it down, I was the only one left inside. I still had some beer left in my glass, which I had to take outside if I wanted to smoke. I stood on the deck in the freezing cold and choked down some nicotine. I stared over the railing into the creek, and wondered quite how I was going to while away this momentous final night. It didn’t look promising. Thankfully the woman appeared again before we could continue the conversation, and gave me directions. It was less than a mile away, but in the opposite direction to the Haddie Pierce. I would have to take the car. She also suggested that I try another bar in that direction called Duffy’s, just across the crossroads from it. A party of sorts was in full swing in the Irish Pub. Most people in there seemed to know one another, and I was very conscious of being an outsider. I ordered draft beer and got given a bottle. I didn’t want to argue. I retired from the edge of the counter, and tried to find some space where I wouldn’t bother anyone. It was only when I had planted myself at one end that I noticed the men were all in one half of the pub, gathered round watching sport and hollering at each other and the TV set. And the women were all in the other half where the TV sets were playing various films without sound. A roaring juke-box filled the air. As luck would have it, I had chosen a spot down the women’s end. I was beginning to attract questioning looks from the men’s end. What was I playing at with their womenfolk? In truth, the prospect of getting my head kicked in was only marginally more alarming than the notion that I might have been even remotely interested in these women in terms of sexual adventure. To describe them as fishwives would be to do a terrible injustice to fishwives. I’d only just arrived and so somehow I had to brazen it out. I turned my back on the room and concentrated on a TV set that was showing There’s Something about Mary. I’d have to take a chance on getting a bottle round the back of my head. If I’d carried on looking at any of the people in there it would have become a certainty. I was reasonably familiar with the film and could follow most of it even without the soundtrack. It had just got to the bit where the Ben Stiller character has arrived at Mary’s house, to pick her up for the prom, and gone to the bathroom. I knew what was going to happen next, and a scream from behind me suggested that at least one of the women did too. I glanced round to see eight or nine women intently concentrating on my screen, with a running commentary being provided by the screamer. When it got to the bit where the father breaks into the bathroom and finds out what has been going on, the woman descended into some sort of hysterical meltdown. It had a remarkable effect. With the men cheering the sport at the other end of the bar, I found myself surrounded by a group of sizzled women chanting “Frank or beans! Frank or beans! Frank or beans!” repeatedly at the top of their voices, even when the action of the film had got past the point in question. That was enough for me. I’d only had a few sips of my beer, but I didn’t need to stick around any longer. They didn’t seem to grasp that it was a movie, or that at least it wasn’t the Rocky Horror Show. This was audience participation in the sense of the Jerry Springer Show or Gladiators. As I was leaving, the ringleader was shouting outraged expletives because the bit where you saw a close up of the damage done to the poor boy’s delectabilia had been edited out. Perhaps there’d been a different cut released onto the US market. I left before a riot started and the TV got smashed in protest. I could only afford to have one more drink and still feel safe with myself to drive. If it hadn’t been my last night, I would have called it a day. As it was, I went to investigate Duffy’s. After all, it couldn’t be much worse. It took a little bit of finding, but proved to be well worth the effort. The only annoying thing about the place was that I hadn’t discovered it at the beginning of the evening. It was more of a restaurant than a bar, but the atmosphere was comfortably informal. In the main body of the room there was waitress service for diners sat at the tables, and along one long side was a bar with stools for drinkers. 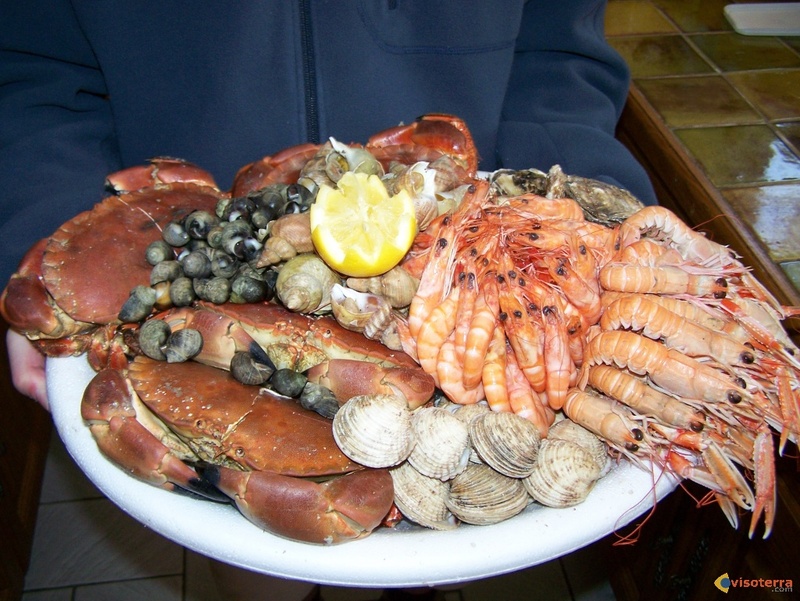 They had a variety of beers on draft, and a chiller cabinet at one end of the bar with a glass front displaying a scrumptious looking array of fruits de mer. It would have made a lavish last night, but it was too late. I resigned myself to settling for limp. I was reluctant to get involved in conversation with anyone in case I was tempted to drink more than my one last measure. Once I’d reached that conclusion, I didn’t even bother finishing the glass I had and sulkily returned to the car. It wasn’t even nine o’clock. Back at Haddie Pierce, Becky was in the lounge talking to another guest called Carol and watching the first TV pictures of the day’s action in Afghanistan. They both turned out to be Rhode Island enthusiasts, and soon the leaflets, maps and pictures were coming out. The smallest state in the Union, it transpired, officially had the longest name: The State of Rhode Island and Providence Plantations. Its claims to fame on the world stage were a trifle thin. Apart from being the home to the America’s Cup for 53 years, and the place where Kennedy married Jacqueline Bouvier, there wasn’t much. It was where the first gas-lit street in America could be found and the state where the first jail sentence for speeding had been imposed. And it was the birthplace of Mr Potato Head, the first toy to be advertised on television. It had not proved to be quite the triumphal climax that I had been looking forward to for weeks. But if you’re looking to go out with a bang, then Rhode Island is probably not the best place to plan to do it.